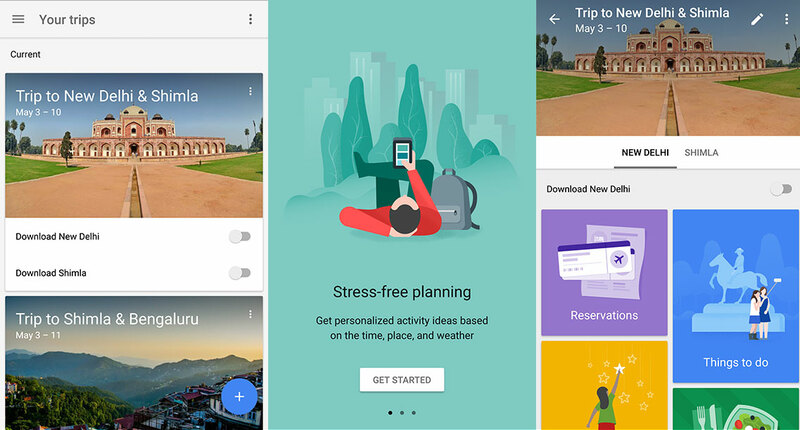 Google has silently released a new application for Android users that can manage your trips and provide extensive information about the places you visit. Google Trips is currently only available in few countries, and there is no official information about the global launch. Google Trips can be said to be in Beta stage, where only a few people are allowed to test it. Though you can still download the APK file of Google Trips from below. We will always update the file with the latest version which is directly extracted from Google Play without any modifications. The usage of the application is very easy, just enter the destination where you want to visit and the period for which you are going, and Google Trips will automatically provide a nice trip guide for you. You can find “Things to Do”, where you can find top spots, indoor spots, outdoor places, etc. with ratings so that you can decide how you can enjoy holidays. Along with this, there is another card “Food & Drink”, where you will find the best restaurants, cafes, bars and pubs to visit. Google Trips also provide you with an option to download the map of places you visit, which helps you to navigate in your destination and source place, even without internet connection. Currently, there are no setting options for the application except for the Gmail integration, but we can see many features in future versions before the global launch of the application. As of now, you can download the latest Google Trips APK from above, but after the global launch, you can directly download it from Google Play. We tested the application in Android 6.0.1 Marshmallow, and it worked fine, though the minimum version of Android required to use Google Trips is Android 4.1. We will soon update the post with more features and usage of the application. To get more updates in Google Trips and other applications from Google, stay tuned with us.